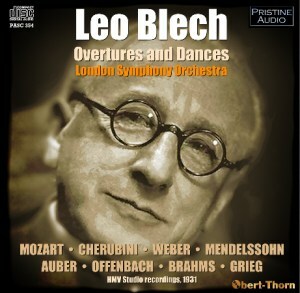 Gone - forever, one hopes - are the days when the words ‘Leo Blech’ were followed by ‘Fritz Kreisler, accompaniments for.’ True, those three Berlin concerto recordings are valuable for all sorts of reasons, but Blech was very much more than an accompanist to instrumentalists and singers. That admitted, his discography is not fully representative of his repertoire. For example when he worked with the LSO in 1927 he started auspiciously with Schubert’s Ninth Symphony. However this HMV contact away from his Berlin State Opera Orchestra didn’t really bear much more extended fruit. A return visit for extensive sessions in 1931, at Kingsway Hall and the Queen’s Hall - if only they were still around! - led to 23 sides being approved for issue. In this disc Pristine Audio presents 20 of them. As producer Mark Obert-Thorn notes, the missing sides were all of music by Mendelssohn, two orchestrated Songs without Words and the finale of the Italian Symphony on two 10” sides. Rather unsatisfactory fare. The programme is a spread of opera to ballet and concert music, some truncated or abridged. Mozart’s Les petits riens is represented by four brief movements. There are some fine string accents and good solid rhythms. It was recorded the month before Elgar recorded Falstaff with the orchestra. Cherubini’s Anacréon overture was spread over two sides in the Queen’s Hall’s splendid acoustic. The LSO winds are largely vibrato-free and the performance is a good one, though not the equal of Toscanini’s or Mengelberg’s. The Oberon overture gets a vigorous dusting down, and two seamless side-changes allow us to enjoy Calm Sea and Prosperous Voyage. Unusual repertoire comes in the shape of the overture to Auber’s Le domino noir, here receiving its first appearance on disc since the aged Pathé from conductor Monsieur Amalou in Paris, back in around 1910. During Offenbach’s Orpheus in the Underworld one can listen to the distinctive woodwind players of the LSO again, who were not quite as timbrally distinctive, or as occasionally startling, as those of the contemporary Hallé Orchestra. It’s somewhat surprising to realise that hardly anyone bothered recording Brahms’ Serenades before the Second War. By Blech’s time only Stokowksi and Gabrilowitsch, in Detroit, had summoned up the courage. This is the work in which the LSO strings, led by Willie Reed, slither about the most. That’s perfectly reasonable, and it sounds good. It may well be the work with which they were most familiar, and thus could coordinate their portamenti. Note, however, in Blech’s case, that only two movements were recorded. Finally we reach Grieg’s Norwegian Dances, a work in which the LSO - due to its HMV contacts - held a recording monopoly before the War. The great early recording is by Schneevoigt with the LSO, on Columbia, but Blech’s is thoroughly engaging, if somewhat less idiomatic. This is a most enjoyable disc, excellently engineered, reflecting - as was HMV’s original intention - various sides of the repertoire, albeit within certain clear constraints. Even if Lauritz Melchior said that Blech was the best accompanist he ever worked with, and there’s no reason to doubt it, discs like this unshackle the conductor from that laudable, if necessarily confining role.